The C64 home computer (also "Commodore 64" or "C-64") was launched in 1982 by Commodore Business Machines. The C64 was built around the 6510, a 1 MHz 8-bit CPU which was an improved design of the very successful 6502. Like its VIC 20 predecessor, the C64 made use of additional custom chips: the VIC-II (Video Interface Chip II) graphics chip and the SID (Sound Interface Device) sound generator chip. The CPU and the two custom chips were fabricated by MOS Technology, Commodore's own chip fabrication company. In a way that is reminiscent of the later Amiga computer, the VIC-II chip and the SID chip had originally been designed for a video games console. In the C64 computer these custom chips not only reduced the workload that otherwise would have been handled by the CPU, while at the same time empowering a new generation of games and demoscene productions, but they also allowed Commodore to use fewer components, resulting in integration efficiencies and cost benefits that could not easily be beaten by the competition. More than half of the VIC-II graphics chip was dedicated to supporting sprites, i.e. on-screen objects for which the hardware took care directly of rendering and collisions. Compared to other computers, this resulted in better performance and simpler software, and was very important for video games. 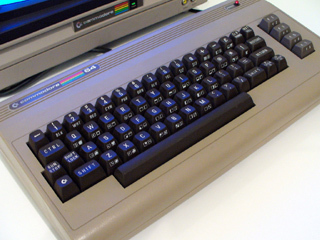 Some C64 successors like the C16 series lacked sprites, which was deemed a factor in their failure. By all means, the C64's SID audio chip also provided superior sound, including the home computer industry's first envelope generator and other features inspired by music synthesizers. The C64 retained the "real" keyboard and TV-compatible output from its VIC 20 predecessor, while featuring an unprecedented 64 KB of RAM. It could store data on audio cassettes, floppy disks and cartridges. Commodore's in-house chip foundry and the technical features of the C64, which allowed it to compete directly against both home computers and video games consoles, were not the only aspects that led to the instant success of the C64 in 1982. Other factors included Commodore's aggressive marketing and TV campaigns, and retail channels which encompassed not only Commodore's traditional dealers, but also department stores and toy stores. Unlike other hardware manufacturers, Commodore perceived its independent software developers and vendors as an opportunity, rather than a threat. This stimulated the development of high-quality content, especially games, at a time in which the market for console games was increasingly fragmented and saturated with low-quality games, further contributing to the success of Commodore and the collapse of the video games market in the early 1980s. Until the demise of Commodore in 1994, the C64 sold over 30 million units, becoming the best-selling computer of the 20th century. Cloanto, a Commodore/Amiga developer since the early days, is the owner of the Commodore/Amiga copyrights and publisher of C64 Forever, the official 8-bit emulation and preservation suite for Windows and other platforms that makes it possible to still enjoy the C64 and its software.